mancrunch.com, the gay dating site, has had its Super Bowl television commercial turned down by CBS. 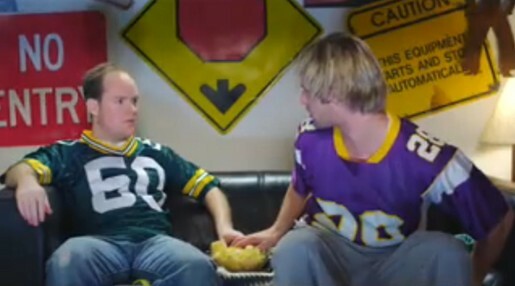 The commercial features two game viewers who support opposing teams but share a bowl of chips. As their hands meet in the bowl they launch themselves into a passionate embrace, much to the bemusement of the guy sitting next to them. The advertisement ends with the tag line, “Where many many many men come out to play”. The Gay and Lesbian Alliance Against Defamation (GLAAD) has released a statement asking CBS to publicly explain its advertising standards after rejecting a proposed Super Bowl commercial from gay dating website Mancrunch.com. The statement points out that the rejection follows the network having recently approved a controversial Super Bowl spot from the Christian organization Focus on Family. “This network should come clean to the public about what’s going on because this seems to be a homophobic double standard,” said GLAAD President Jarrett Barrios.